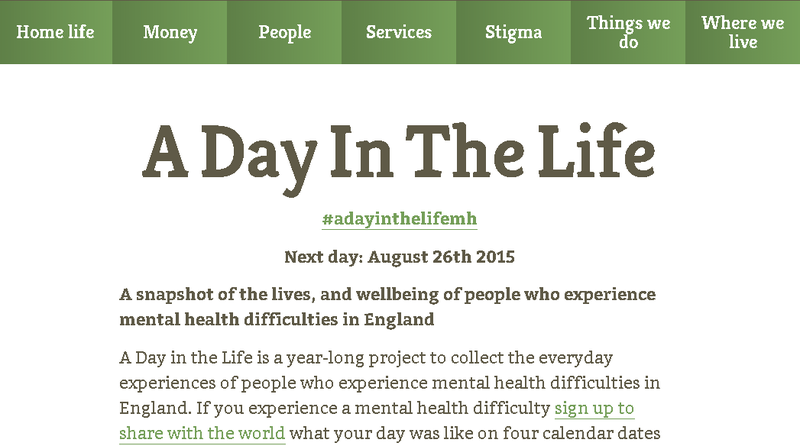 In November last year we helped launch ‘A day in the life’, a project which asks people with a mental health problem to blog about a day in their life - on four set days across the year - providing insight into their everyday experiences. The project aims to capture insights into what living with a mental health problem is like. Bloggers are asked to write up to 700 words in answer to a simple question, ‘what made your day better and what made your day worse?’. ‘A day in the life’ is the brainchild of Mark Brown of social enterprise Social Spider CIC who I’d like to congratulate for a fantastic job managing this enormous project. We aren’t aware of anything like this being done in England before. The project provides a wealth of insights and evidence for a wide audience of people and agencies, across the health and social care sector and beyond who wish to have a better understanding of the daily experiences, both positive and negative, of people living with a mental health problem. The project has also created a unique collection of experiences, insights, stories and written pieces, collated into themes such as health, home life, money, people and stigma, that can be read by the general public. Each post is as anonymous as the user chooses to make it. However, self-submitted metadata including age, location, town/city/village/other rural area, whether the individual is currently receiving mental health treatment, whether they have other long term health conditions, gender and ethnicity will allow in-depth analysis in the future. If you haven’t – I urge you to visit the site and read some of the blogs. They provide a rich and insightful look into people’s lives and their wellbeing which can often be missed from more traditional literature on mental health. Sharing these experiences widely offers an opportunity to better understand mental health problems, in turn addressing and challenging some of the stigma surrounding mental illness. We have received very positive feedback from people with mental health problems and people without who have shown their support for the idea and have enjoyed the experiences of engaging with and reading the posts. Similarly, mental health professionals and those involved in commissioning and providing mental health services have valued the experiences that people have shared. The project has focused on four key dates over the last year, with the final of the four days rapidly approaching on 26 August. This is your last chance to contribute to this project that has seen over 770 posts uploaded and published online. In the process of publishing the posts throughout the year, we’ve noticed the following as often mentioned as having a positive impact on health and wellbeing: romantic partners, family, local activities, community, work, education and volunteering. "We discussed the week ahead, he told me that “my only job at the moment was to get myself better.” We talked about what I might be able to do, and he helped me break down my workload." "A friend texted and asked if I fancied a chat. Once we got talking, I really enjoyed it: hearing his news and him telling me I had reason not to feel up to getting on with some things I felt people expected of me." “The support network on Twitter for people in my situation is incredible, and without it I think I would struggle hugely to keep going every day. My sense of isolation has decreased significantly and I feel supported and validated when I talk to these people, my “Twamily”. These passages barely scratch the surface of what’s available on the website. ‘A day in the life’ offers a unique opportunity to gain a better understanding of the daily lives of people with a mental health problem. I would encourage all those who are interested to explore the project in more detail, share with your friends and family and perhaps someone you know may benefit from signing up.